When Cayti Kane delivered a baby boy via cesarean section last year, her team of doctors was prepared. Kane had been diagnosed with placenta accreta, a condition that increased the likelihood of a dangerous hemorrhage during delivery. When that happened, she had an emergency hysterectomy. Kane and her son went home healthy. Can ‘Social Determinants’ Data Really Improve Patient Care? In what some suggest is another ethically questionable version of medical sleuthing, companies are now scanning public records that provide clues to individuals’ “social determinants of health,” or SDOH—such as arrest records, bankruptcy filings, voter registration, address changes, and marriages and divorces—that, in combination with traditional prognostic tools, may predict an individual’s likelihood of future healthcare needs and costs. Even as big tech players have conquered the markets in industries like transportation and lodging, they’ve largely steered clear of mental health treatment. Now, however, with an influx of funding, companies are revamping pills with digital sensors, designing virtual reality worlds to treat addiction and other conditions, and building chatbots for interactive therapy. When Cheryl Daigle started coughing in February 2013, she chalked it up to the sneezing and sniffles that had held her hostage for the past week. After all, it seemed like everyone around her was sick. Yet as days turned into weeks, Daigle’s cough only worsened, and each fit began to usher in a frightening inability to take a deep breath. When you go to your doctor’s office, sometimes it seems the caregivers spend more time gathering data about you than treating you as a patient. Electronic medical records are everywhere – annoying to doctors and intrusive to patients. But now researchers are looking to see if they can plow through the vast amount of data that’s gathered in those records, along with insurance billing information, to tease out the bits that could be useful in refining treatments and identifying new uses for drugs. The kidney doctor sat next to Judy Garrett’s father, looking into his face, her hand on his arm. There are things I can do for you, she told the 87-year-old man, but if I do them I’m not sure you will like me very much. The word “death” wasn’t mentioned, but the doctor’s meaning was clear: There was no hope of recovery from kidney failure. Garrett’s father listened quietly. “I want to go home,” he said. It was a turning point for the man and his family. It had been weeks since Tina Willis had gotten a good night’s sleep. All the tossing and turning left her with a familiar feeling of dread: Years ago she had suffered a debilitating bout of insomnia, and she knew that if she didn’t do something, she’d find herself back at that same sleepless place. So the 48-year-old, Orlando-based personal injury lawyer looked around for a doctor in her area who could get her answers. After consulting a few physician review sites, she clicked on a link for one general practitioner who saw patients with sleep issues and had the highest rating possible—five stars. Willis booked an appointment, but the visit didn’t exactly go as she’d hoped. Sepsis is the third leading cause of death. Can a new blood test change that? 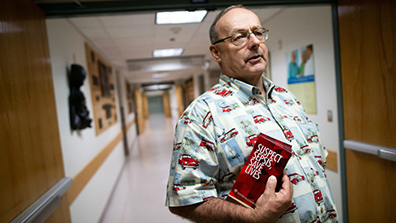 In his spare time, when he feels up to it, Ronnie Roberts walks through hospital parking lots slipping informational flyers onto every windshield. Roberts wants people to know the signs of sepsis, the body’s overwhelming response to a blood infection, which can lead to organ failure and even death. If he had known the signs and insisted that his fiancee was treated appropriately, he believes she’d still be alive. Sepsis kills over 250,000 people a year in the United States — more than any cause other than cancer and heart disease. But still, many people have never heard of it. And hospitals often fail to notice the warning signs when a patient is spiraling downward.